Meet Alexis “Lexi” Arledge, our UVA volunteer and intern. She has been working with the Women United in Together in Philanthropy (WUP) Communications Committee to help organize for sustainability. Currently, she is developing plans to expand WUP’s social media presence over the next year. Once she learns more about the organization, she hopes to work with other committees, such as the Grants Committee. She is excited to be working with such intelligent women who also share her love of philanthropy. Lexi is a third year at the University of Virginia. 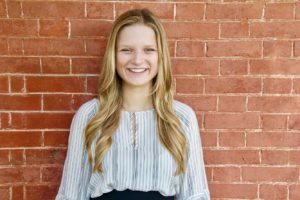 She is in the McIntire School of Commerce studying Information Technology and Marketing with tracks in Business Analytics and Digital Media and Promotions. After completing her undergraduate degree, she plans to attend law school and study commercial law. At UVA, she in heavily involved in her sorority, Zeta Tau Alpha, and is a member of the Virginia Alpine Ski and Board Team (VASST). Outside of UVA, she works as an adaptive ski instructor teaching people with mental and/or physical disabilities how to ski at Wintergreen Resort. In addition to skiing, Lexi is an avid cyclist and two summers ago, she biked across the country with a non-profit organization called Bike and Build to raise money and awareness for affordable housing. Lexi has just returned from completing studies in The Netherlands.